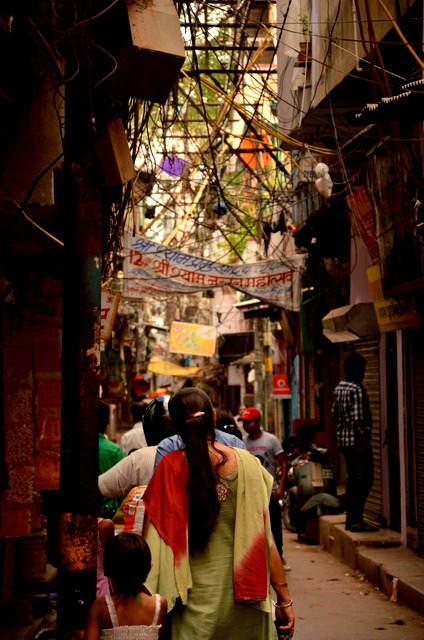 In the monsoon of 2012 we visited Old Delhi almost every week for a group research project at architecture school. 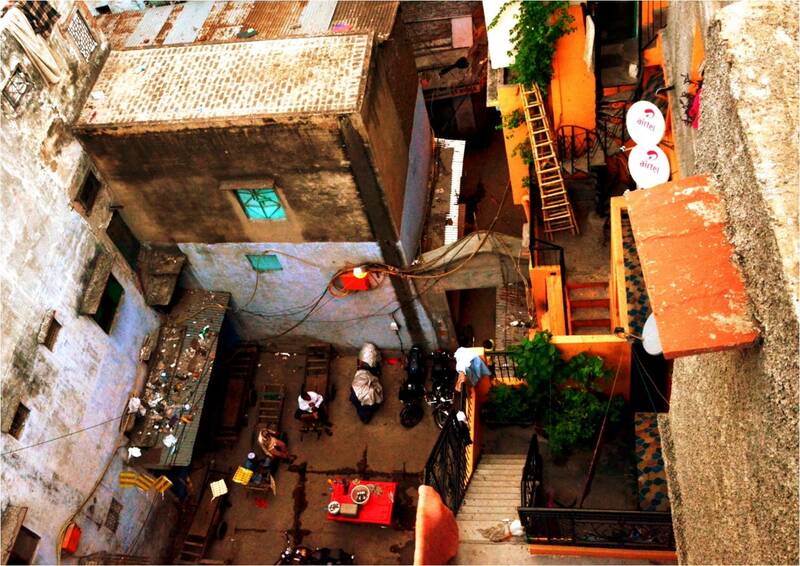 We were trying to understand the Old City’s complexity and see how it was different from the Delhi that we lived in. 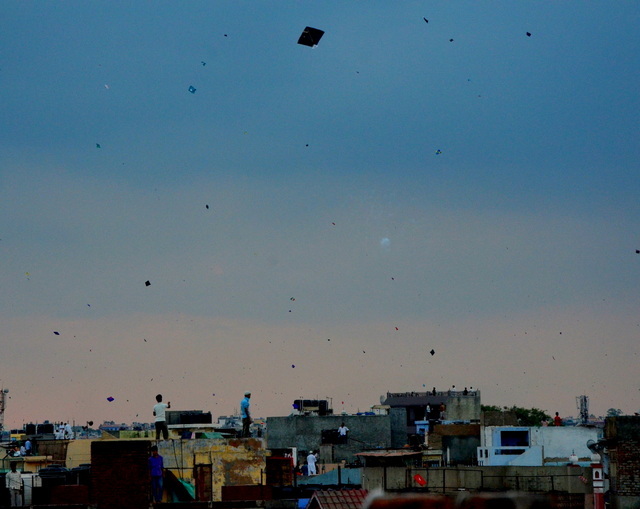 Over many visits to the same mohalla (neighbourhood), we had effectively invited ourselves over to the home of a family we had befriended, for iftaar and flying kites. Our families remained skeptical about us going there on Independence Day – perhaps it is human nature to be wary of what one doesn’t understand. Although, not too eager to sacrifice a holiday for what seemed like work, our curiosities still got the better of us and we pushed ourselves to just go. From the moment we emerged out of the ground from the metro station at Hauz Qazi Chowk (popular as Chawri Bazaar Metro Station), we realized that it was indeed a special day. This Chowk, where the crowds were usually dizzying, was almost deserted. We hopped on to a cycle rickshaw and started making our way to Sharif Manzil in Ballimaran, a place we had frequented ever so often over the summer. As we entered Ballimaran, we realized that the streets that were usually bursting with people and commerce were silent – just long rows of closed shutters. Some men were selling goats for sacrifice – Eid was coming up in a few days. For a fleeting moment one assumed that with Ramzaan going on, all shops being shut and the weather being sultry, most people would be indoors- just another holiday like it was for most of ‘New’ Delhi. Little did we know. Crossing Ghalib’s haveli, we ventured into the gate of Sharif Manzil. We spotted our friend and host, 27 year old Amir and his cousins on the terrace, five floors above us, from the chowk in front of their building. Amir’s ground floor garment shop that also sold kites during the season and the neighbouring cyber cafe were both shut. Amir had asked us to make our way up to the chhat. The first flight of steep and long stairs took us directly to a generous balcony on the second floor. We went up the rickety spiral staircase, passed through a passage and climbed a ladder to reach the fourth floor. Finally we walked up a narrow staircase to the terrace and we were engulfed with sounds and color. The terrace itself was not so much a flat plane but a collection of distinct rooftops connected to each other. The highest of these had been appropriated by the patangbaaz. We arrived just as the motley crew of boys and young men were helping Amir set up a kite, thread the ribs and roll the manja on to the pin. Their undeclared captain wielded the huge kite, maybe five times the size of a normal one, tugging at it, waiting for it to catch the wind. Middle aged uncles looked on endearingly, calling out advice as they deemed fit. It was a grand production. 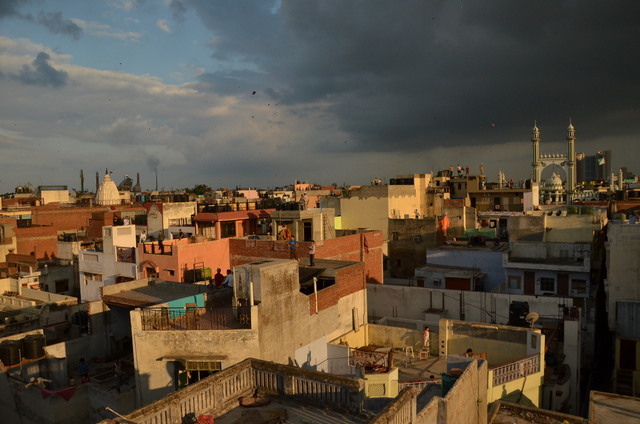 Interactions with Amir and his family, who have been residents of the mohalla for generations, revealed that even though the closeness between neighbours had reduced over the years, there remained an implicit feeling of mohalledari. Children were jumping across parapets from chhat to chhat , and everyone was a chacha, tau or bhai – there was an overwhelming sense of familiarity. 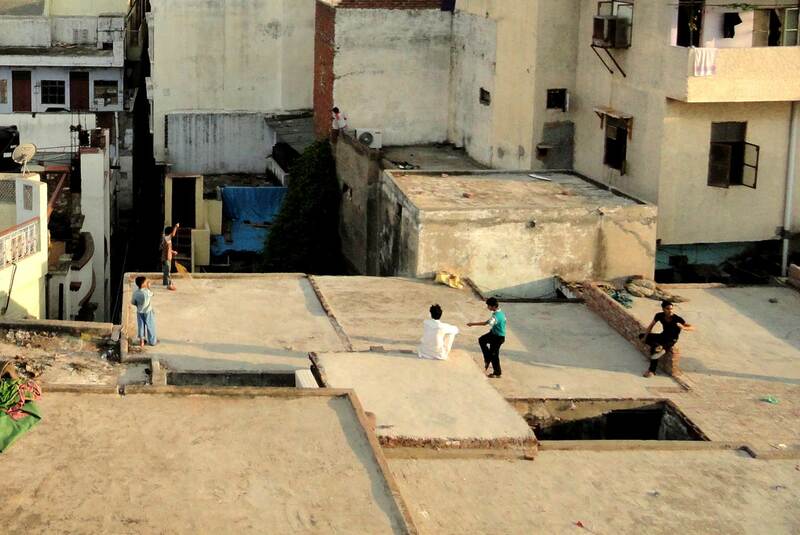 The visual connection across terraces enhanced the interaction, both within and between mohallas, at a scale which is not imaginable on the street. Though the terraces belonged to individual families, they were not distinct from each other, making them a common resource for the mohalla. The chatt was a whole new realm of public space. Occasionally, one would see, a flock of pigeons collide with another and then circle back to their masters. The sport of kabutarbaazi is still prevalent in many neighbourhoods in the Old City, where a kabutarbaaz trains his pigeons to not only come back on call but also steal a few from other flocks on the way! The Khans themselves had many pigeons, some of whom were bought at prices as high as 20,000 rupees a pair. The sky was mesmerizing as the sun started to set – the tricolor, backlit by the waning sun and the approaching clouds, and was fluttering against a sea of terraces. In that light, even the monstrous MCD building suddenly looked quite harmless. The patangbaazi was starting to wind up and Amir’s kite, which had soared high up and attacked fiercely at first, had met its end as the winds changed. Soon the azaan was called, one mosque after the other. There were fireworks at the Jama Masjid as the sky went pink. We helped spread some mats and bring out the food and sat with the entire family on the chhat. They opened their fast (roza) with dates and fruit. It felt private, but they were genuinely warm and welcoming. We joined in the feast of hot pakoras and gulped down some Fanta for good measure. 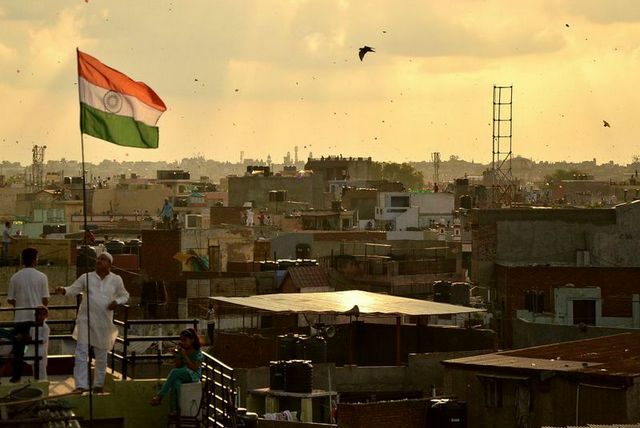 Being a part of that spirit made us realize that in this part of the city, 15th August is so much more than just another holiday, it is truly a celebration, not just of our independence but also the monsoons, the winds and togetherness. This day was all about collectively appropriating the sky, which belongs to all of us, with hundreds of kites and flags, by people, young and old. And there is a strange sense of freedom in just this awareness. This post is co-written by Bhavika Aggarwal, Rohan Patankar and Varun Bajaj. It is a recollection of their visit to Old Delhi on 15th August, 2012 as part of a research project with Ammani Nair and Vani Sood. Their research paper ‘By the People : Complexity in the Commonplace’ can be found here. A version of this post appeared on the August 15, 2014 issue of The Scribbler. Remember our post and debate on the Indraprastha Park? Well, we decided to actually visit the park, and, you know, see for ourselves whether our fancy theories and top-down discussions hold any merit. We went around 4 in the afternoon, and it was blazing hot, but there was no dearth of people. Mostly young (and middle aged, and young and middle aged) couples under bushes and behind trees, but also some uncle-types and school boys all hanging out together. The reason why we don’t see any cars, cycles, etc. parked out front is because the park has a very nice and convenient parking lot, which was pretty much full when we visited. It also has a designated canteen area, with lots of stalls and seating. The Park is surprisingly peaceful, even with the Ring Road right next door. The park is surprisingly peaceful, being next to both the Ring Road and the railway line. And the west edge is absolutely brilliant, simply falling down to the railway line some 3-4 metres below. The railway line, from the western edge of the Park. 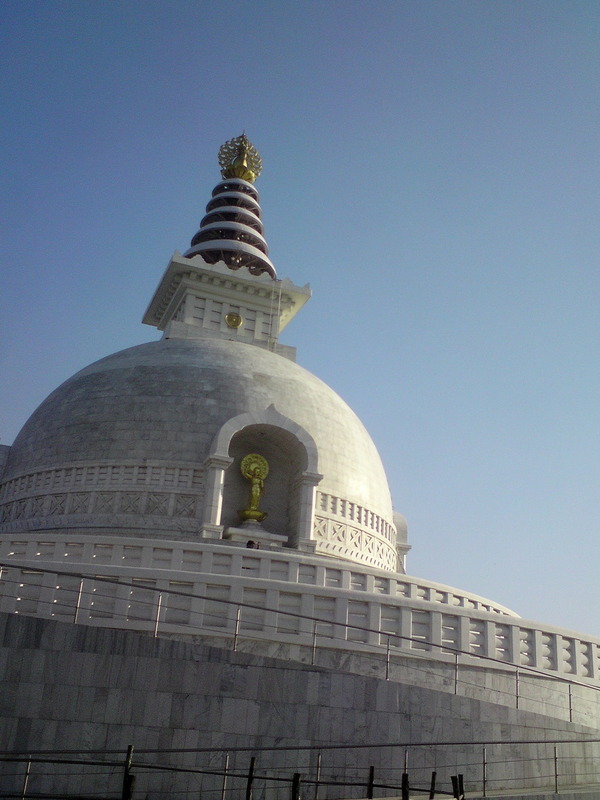 We also finally went to the white marble Shanti Stupa, the one which you can see gleaming in the sun from the Ring Road. It was actually being cleaned, necessary to maintain its shine, I guess. (The park also had plenty of malis and security guards, so maintenance is definitely not an issue.) And well, it’s a real stupa, and not a fake one, like I stupidly thought it would be because it’s not ancient. The modern Stupa, complete with a universal access ramp. It’s definitely authentic, complete with other Buddhist signage and inscriptions out back. And we were very, very lucky to see a young Budhist monk, in ceremonial orange and yellow robes, pay his respects to the stupa and the other monks living behind it. It was surreal, almost unbelievable that we were still in Delhi. 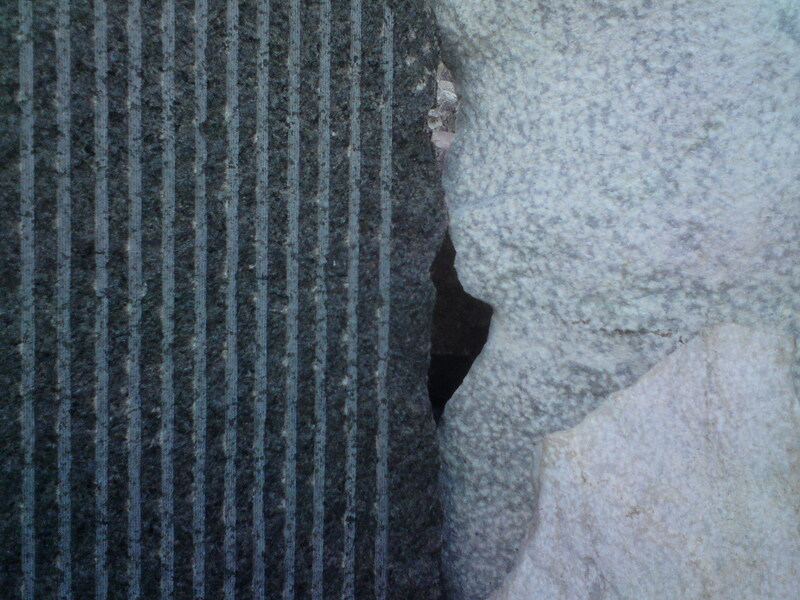 The amazing stone work and textures in the Japanese-style "zen garden", sadly inaccessible. So, were we completely wrong? Is the IP Park a sensible and perfect-as-it-is land use decision? The Park is very nice, and so what if it doesn’t have a specific function? It seems to function quite well as a public park. This challenges most of what we’ve learnt in our Theory of Settlements class, and otherwise. Is it again a case of “technocrats” theorizing without understanding the ground conditions? But what we’ve learnt does make sense: of course good public spaces need to be easily accessible and have relevant functions. Perhaps Indrapratha Park is an exception, but I have a feeling we’re missing something here. Maybe it’s more accessible than we think, and it has another entrance, or maybe there are some offices nearby because of which we saw so many office people. Either way, there’s no questioning the publicness of the Park. So, we eat humble pie (and our words). 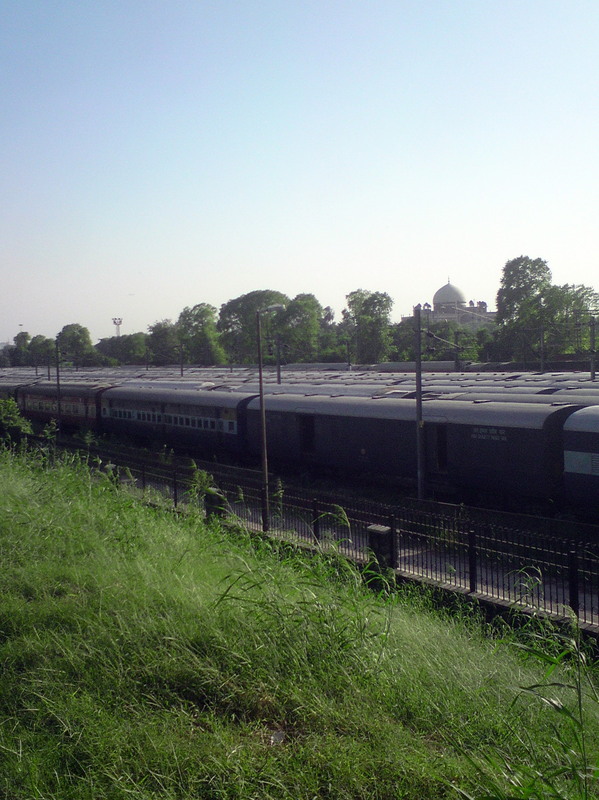 There are numerous problems associated with Delhi that do not appear to have ready solutions. Some of the causes are easy to identify: it is widely understood, for instance, that low-density development causes traffic congestion. 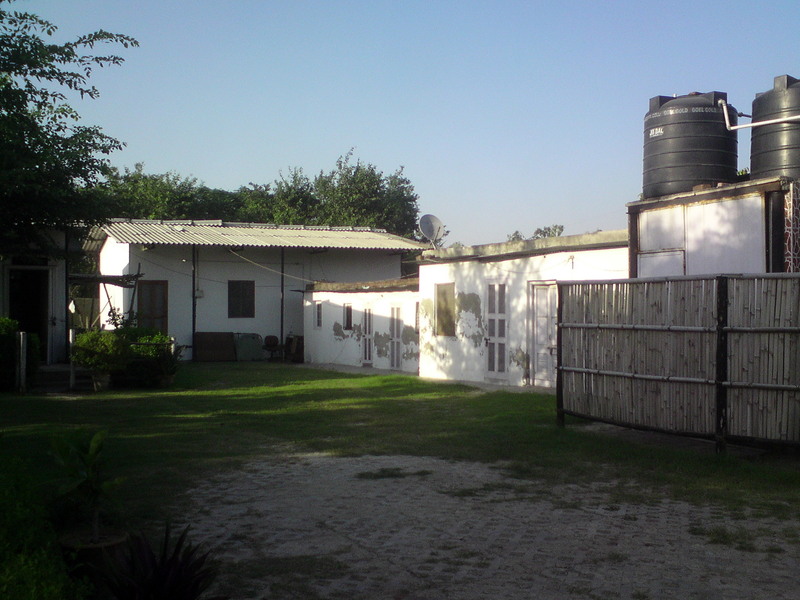 In the case of Delhi the situation is exacerbated by the lowest densities occurring in the ring that encircles the commercial heart of the city, while higher densities occur further out. This phenomenon was recently termed (very aptly, I think) “the inverted suburb” by our Design studio faculty Dr. Leon Morenas. It definitely adds to -in fact, is one of the main reasons for- Delhi’s traffic problems, but I think I agree with Varun when he says that the solution can not be to increase the built in Lutyens Delhi. Can you imagine the city without this green centre as breathing space? Of course, there are other issues, such as how these green spaces are mostly private and also never used as such in our climate, but the point is that they also act as necessary lungs for the city. 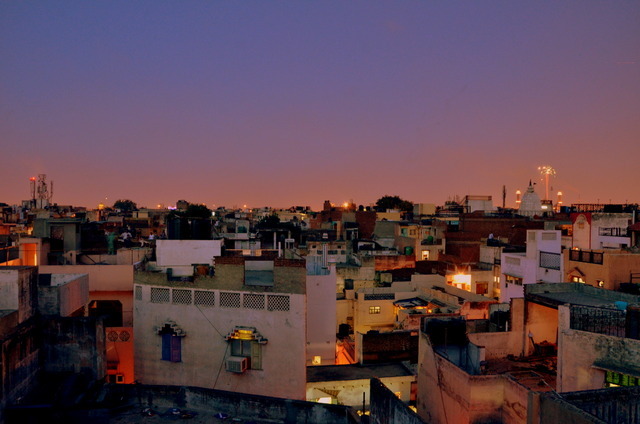 And how awesome is the fact that (according to the Masterplan 2021) Delhi is one of the greenest cities in the world? Another easily identifiable problem is the astonishing amount of unused or ill-used land in the city centre, including a suprising amount of decayed industrial land that lies empty. 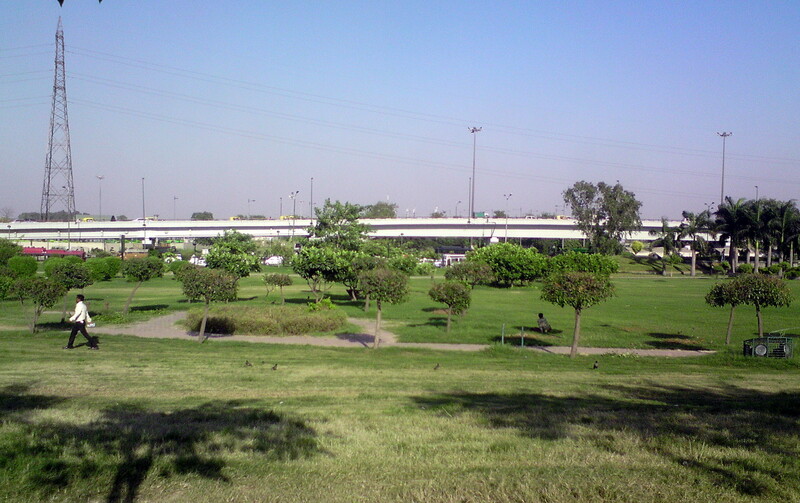 Among many startling inept land use decisions must be counted the new Indraprastha Park between the Ring Road and the main north-south railway line near the Yamuna, which is inaccessible by foot from any residential neighbourhood apart from Sarai Kale Khan- surely a prerequisite for an urban park! This park is very close to college, and this is another thing which I’ve always wondered about- who uses it? I never see any people about, though I confess I’ve never been inside, and only seen it from the road. Of course pedestrians can’t use it -crossing that stretch of the Ring Road is near impossible- and I don’t even see any cycles or cars outside it, so we can’t even say that non-pedestrians use it. Neither have I ever seen any hawkers or ice-cream walas (who unfailingly congregate around used public places). The large public park(s? ), bound by the railway line and the ring Road. This just begs the question: What were they thinking? Actually, they probably had pretty good intentions, of providing Delhi with a very well designed and landscaped public park, but how could they not have thought of something as basic as accessibility? 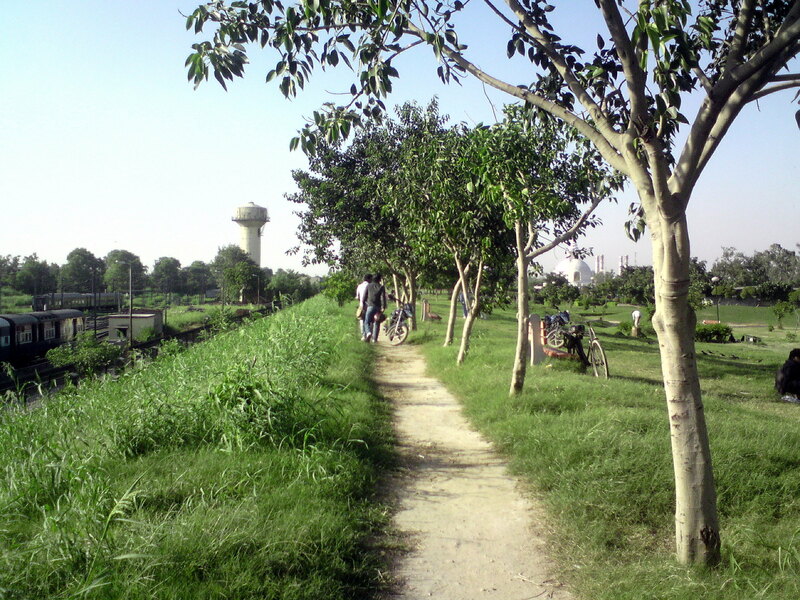 The Indraprastha Park opened in 2004 over a saturated landfill site. Hence, its location was not determined by its pedestrian linkages at all. I guess the intention was to give the city a green lung and a visually pleasant open stretch. (BTW, I absolutely love the Jaali detail on the boundary wall of the park, will try getting a picture soon). About the desertedness, I have seen lots of school buses and cars parked on weekend mornings, but surely, its complete potential hasn’t been realized. Partly because of inaccessibility, and partly because of its bleh function. If the need and use of the open space, could be identified (maybe, themed) more specifically, it would pull people out of their neighborhood parks, for stronger reasons, repeatedly. So, what do you guys think? How can this Park be made more successful? What other intervention would have made more sense or been better suited to the site? Which public function (that the city lacks) could have been accommodated here?